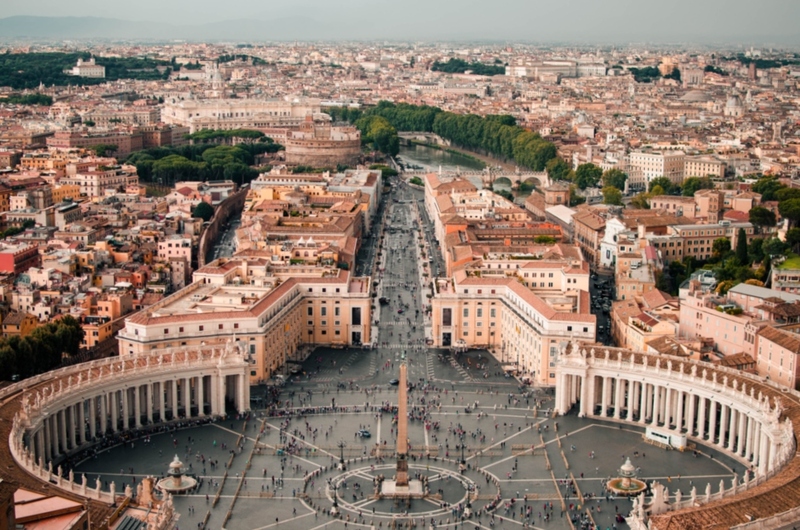 Need help deciding which places you should see on your first visit to Rome? Unless you have a few weeks to spare or are happy to run around at the pace of an Olympic sprinter you are going to need to make a list. On our first visit to Rome, we spent five fantastic days exploring the city. It's certainly one of those places where you pinch a couple of times a day to make sure you are not dreaming. During our short stay, we managed to see all the amazing places on this page. Along with our favourite ten places we visited on this trip, we have listed five more at the top of the list for our return. This is a city that has so much to offer you really should take your time and soak it all in rather than running from site to site barely stopping to breathe. It's good to realise you will probably have to compromise a little on what you can realistically see and do in a short visit. We decided to leave a few things on our list for a return visit as Rome most certainly deserves a repeat. If you only have 4-5 days to spend in Rome don't rush trying to fit in day trips. There is enough to explore right in the city if you only have a few days here. 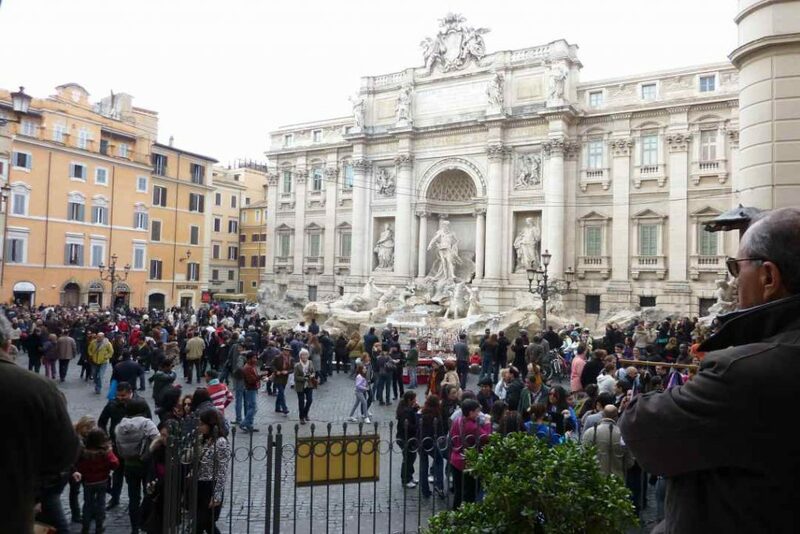 Let me begin by saying we visited in early March before Easter and the crowds that descend on Rome for Holy week so this may have made our experience different to what you will encounter if you visit in high season. We had read about long queues at the Vatican and so decided to avoid the very early morning when large group tours arrive. We arrived at 2 pm to find absolutely no line at all. 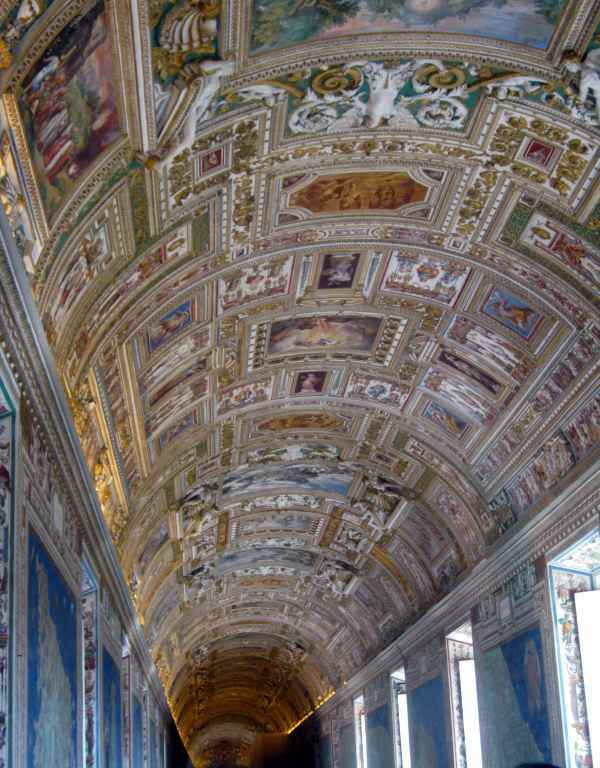 There was plenty of room in all the galleries until we reached the Sistine Chapel, which was standing room only. We decided against joining a tour. There are plenty of signs and explanations here and so much to see that I am sure you would not get to cover much in a group, there just would not be time. If we had the budget, I would have booked a private guide. Our 3 hours here flew, but we felt we had seen enough. It is quite overwhelming and I am sure we left enough for a repeat visit. My favourites spots here were the map room, to me almost as beautiful as the Sistine, the paintings in the Pinacoteca. Our daughter loved the Egyptian rooms. You are not permitted to take photos in the Sistine Chapel, so I am sharing this shot of the ceiling of the map room. Apparently, a Japanese company sponsored the restoration of the chapel and as a result, have the rights to photography on the roof. On the day we were there, almost everyone was sneakily snapping away. Where: Viale Vaticano - Don't do what we did and walk to St Peter's. The Muesum entry is a good walk around the block from ​there. Double check any other details you need to plan your own visit including opening hours and prices are on the official Vatican website. 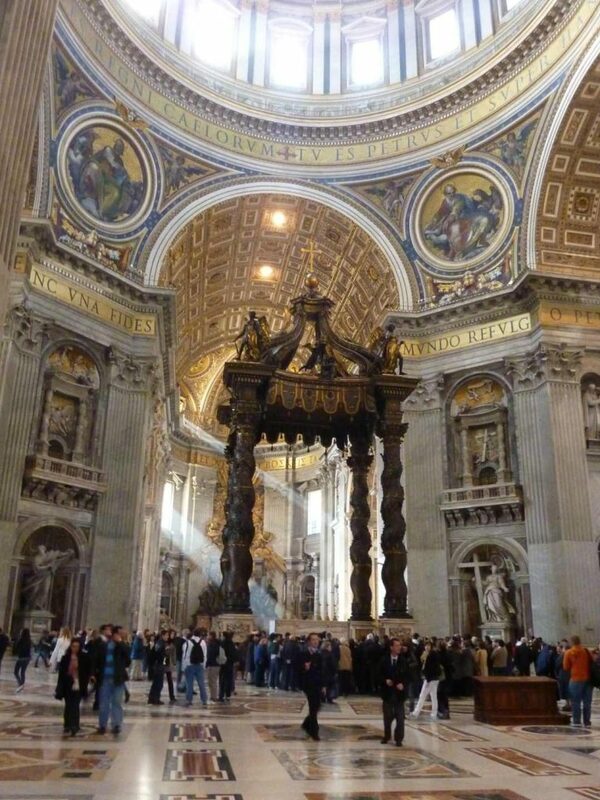 ​St Peters is one of the world's largest churches. It totally took my breath away. We arrived in the late afternoon as the sun was streaming in over the main altar. This was a lovely time to visit. Michelangelo's Pieta above had been the number one sculpture I wanted to see in Rome and I was surprised to find it in a corner receiving very little attention. The detail in this 5-foot high work is amazing. In the afternoon the sun streams in the windows at St Peter's to the centre of Bernini's Baldacchino. You can take a guided tour and even climb to the top of the Michelangelo designed dome for fantastic views over the city. Unfortunately, we arrived too late in the day for this (last entry is 4 pm). When: 7 am to 6 pm or 7 pm depending on the time of year. Arrive early to avoid the crowds. The Forum was one of our favourite places in Rome. To get the most from your visit here either organise a guide or rent an audio tour and use one of the before and after books for sale outside most sites in Rome. Don't be tempted to head straight here though. 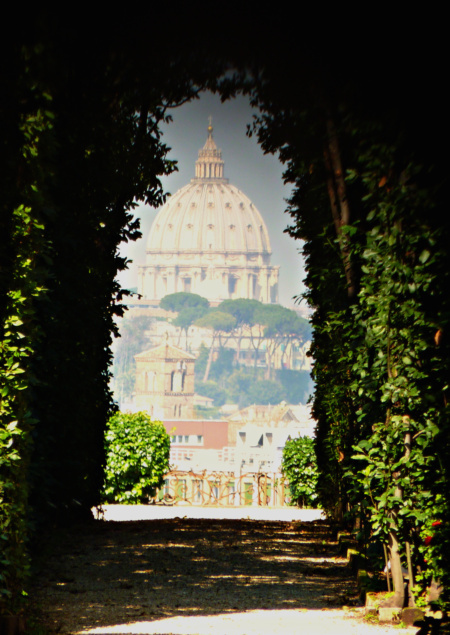 We suggest you begin your day at Palatine Hill. The highest of the seven hills of Rome this was once the most desirable place in the city. Home of the aristocrats and emperors including Augustus, who was born here. 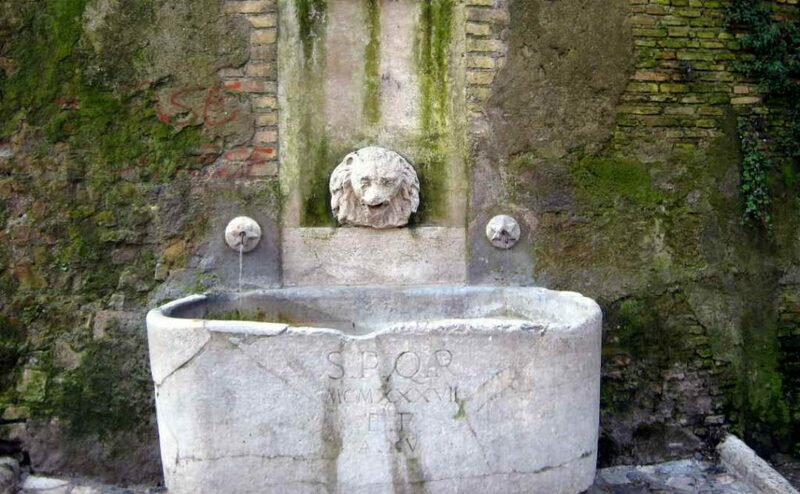 Even Romulus and Remus are said to have been found here, this is where ancient Rome began. The ruins are in better condition than those at the forum. If you have time, include tickets to the House of Augustus. You will not be disappointed. As it sits high above both the forum and the Colosseum, it is a great place to get your bearings before you venture down to explore further. How: We started our tour of ancient Rome at Palentine Hill and bought a ticket here that included entry to the Colosseum and the Forum. At busy times the lines at Palentine Hill are much shorter than those at the other two attractions. We visited the Colosseum with our private guide Ron as part of our day in Ancient Rome. He made us walk right past it up to Palatine Hill to tour there and through the forum before we were finally allowed to go inside. I highly recommend paying to head inside. It was incredible to see it from so many angles and learn so much about the place it played in the daily lives of the ancient Romans. 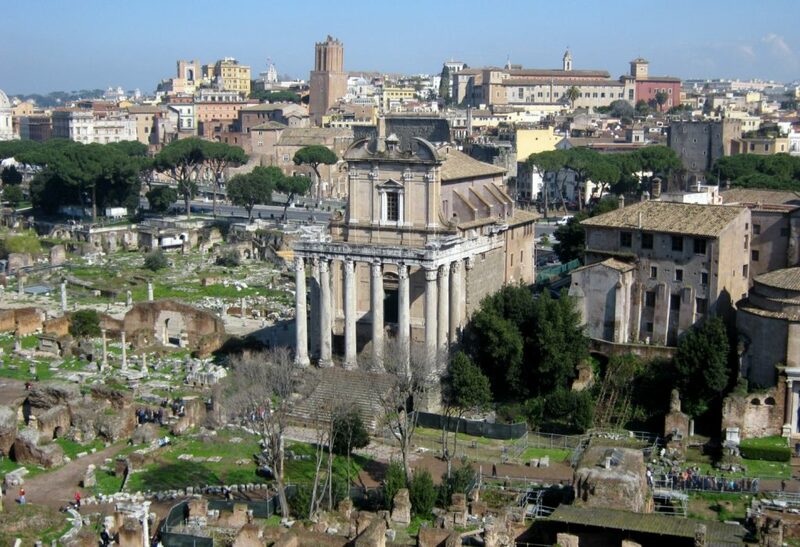 Perhaps the best-known image of Rome, you must visit and see just what a marvel it is. 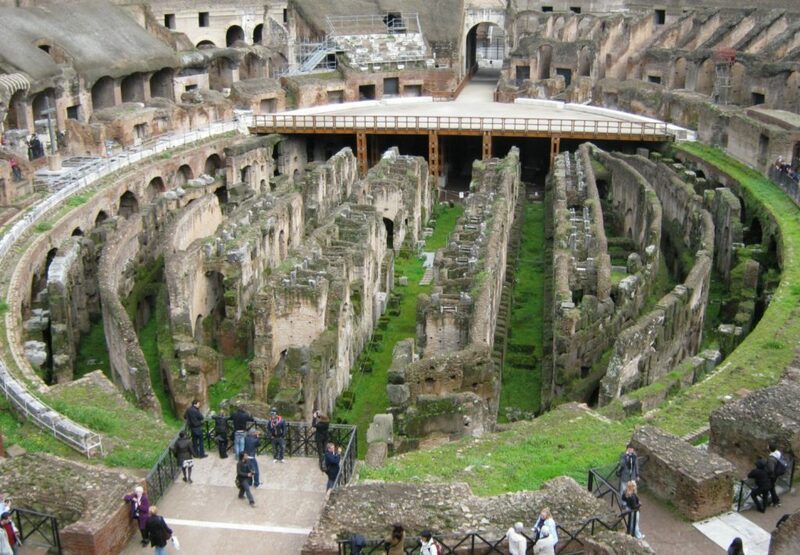 If you want to visit the upper terraces of the Colosseum you will need to buy advance tickets. It only costs 2 euro extra to buy tickets online and I would recommend this if you are visiting between Easter and October. We planned to go back and see it all light up at night, but unfortunately, we were too tired by sundown each day to trek back over. There are lots of rooftop bars overlooking the site I plan to enjoy a few spritz next time we are in Rome. When: 8.30 am to 4.30 pm (winter) and up to 7.30 pm in summer. Avoid visiting between 11 am and 3 pm in warmer months. 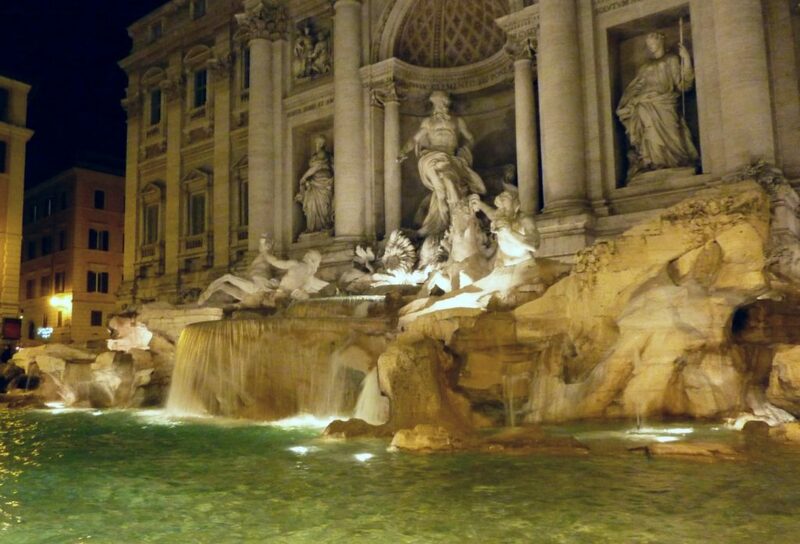 Whether you grew up watching Roman Holiday or Angels and Demons it's likely you are familiar with the Trevi Fountain. The largest of the stunning baroque fountains in the city a short stop here is a must do. I decided after a nice dinner in the back streets near the Spanish Steps that we should walk to the Trevi fountain to complete our first day in Rome. This, after a 22-hour journey that had ended at 7 am that day. Madness I know but I got it in my head that this would be perfect. Well over an hour later when my husband was on the verge of threatening divorce we rounded a corner, and it appeared. Somehow a series of wrong turns had sent us back to Piazza Della Republica before we finally asked for directions and made our way back. The lesson here... always have a small map handy. I think the reason we got so lost is that I was expecting the fountain to be in a huge piazza and when we kept hitting small streets I was thinking no it can't be here and turning away. Visiting at night like we did the first time was actually pretty special because we were almost entirely alone and missed all the souvenir merchants and crowds vying for photos. Resist any urge to jump in and paddle, if you get caught it could cost you €500. Over €3000 is collected every day! In case you are wondering all the money collected here is used by the charity Caritas to provide food and essential items to locals in need. When: I actually preferred visiting at night - but take a tripod if you want a good photo. The Musei Capitolini, created by Pope Clement XII, was the first museum in the world to open to the public in 1734. This place surprised us. 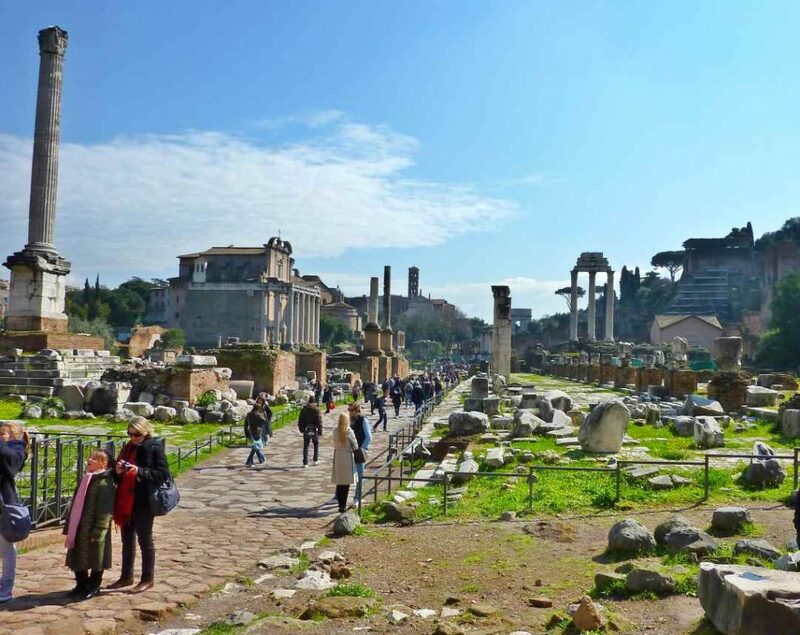 We had read about it in our guidebook, and it was on the maybe list, but it was only after arriving in Rome and visiting the Forum that we decided we needed to visit to see the artefacts collected from ancient Rome. We had found the square on our first day here and what we could see in the courtyard looked fascinating. We decided to visit the next day when the weather turned cold, and we being indoors seemed like a good idea. 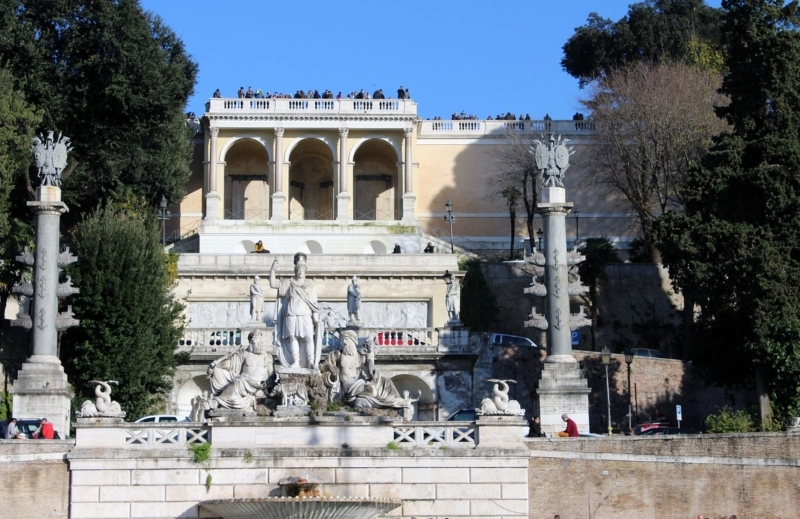 The Piazza del Campidoglio where the Museum is located was designed by Michelangelo. In the centre is a giant statue of Marcus Aurelius upon his horse. This is a replica, the original, made between 12th and 16th centuries, is now housed inside to protect it from the elements. 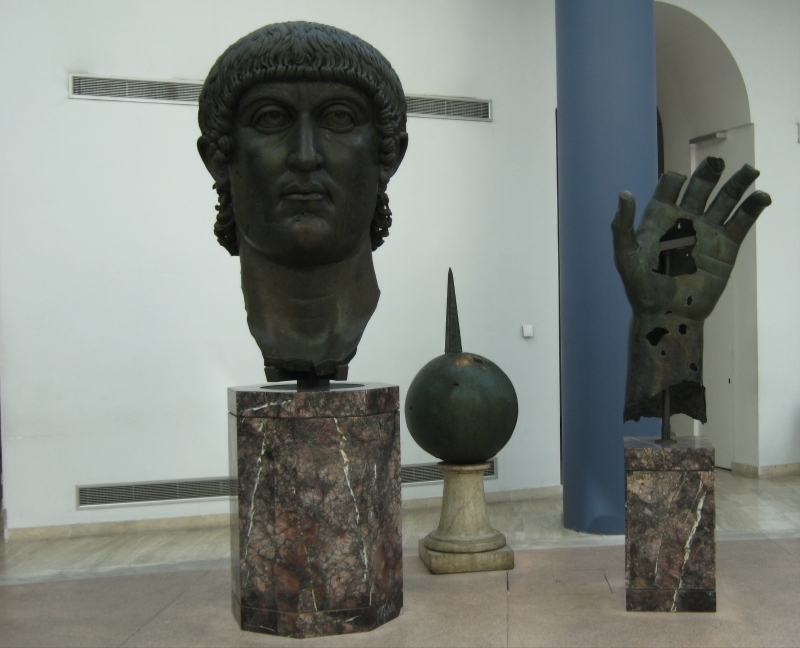 The courtyard is home to the enormous statue of Colossus of Constantine's foot and other a few other parts of his body. Seriously hard to imagine how big this figure was. Photo Tip: The rear of the museum provides an incredible view over the forum and is the perfect place to take a great photograph like at the top of this post. There is also a good, relatively inexpensive cafe on the second floor and views from here look out over the city and provide a great panoramic shot. How: Short walk from Piazza Venezia where over a dozen buses stop. Another of my little missions was to drag my family up the hill to check out the view from St Peter's through the keyhole. Again we got a little lost, but at least this time we took the bus. From the bus stop, it was a decent uphill walk, but we were rewarded with a fantastic view over the entire city. The walk let us see a few different sides of Rome. There was an elementary school close to the Knights of Malta, and it was nice to hear and see the kids playing and watch a little bit of life in the suburban streets on the way. You will know you are in the right place when you come to a white wall with a grand looking stone gate and a green door. There will more than likely be a few people lined up to look through the keyhole. Most take a photo so it can take a little while to get your turn. I took this one without a tripod so it is not a well focused as it could be. You certainly feel a little pressured by the people waiting in line to be quick. Try to avoid a very sunny day as it is hard to get the exposure right with too much light. Detour: While you are in the area it's worth stopping off at Bocca della Verità, the Mouth of Truth on the way back down the hill to the city. Rumour has it that if a liar places their hand inside its mouth, they will lose it. Gregory Peck tried it in the movie Roman Holiday and thankfully escaped with his so I gave it a go and am happy to report that I am still typing with both hands. You will find it in the front of the 900-year-old church of Santa Maria in Cosmedin. Where: At the top the Aventine Hill at Piazza Cavalieri di Malta in Via di S. Sabina. The keyhole is in the green gate of number 3 at Piazza dei Cavalieri di Malta on the Aventine Hill. From the outside, this church does not look at all special. In fact, if we were not led to here by our guide we would likely have walked on by. Once inside you find the only Gothic church in Rome and home to some amazing art. The Church built between 1280 and 1430 has the most beautiful blue vaulted ceilings and is also home to a statue by Michelangelo called Risen Christ. Feel free to touch this amazing artwork. 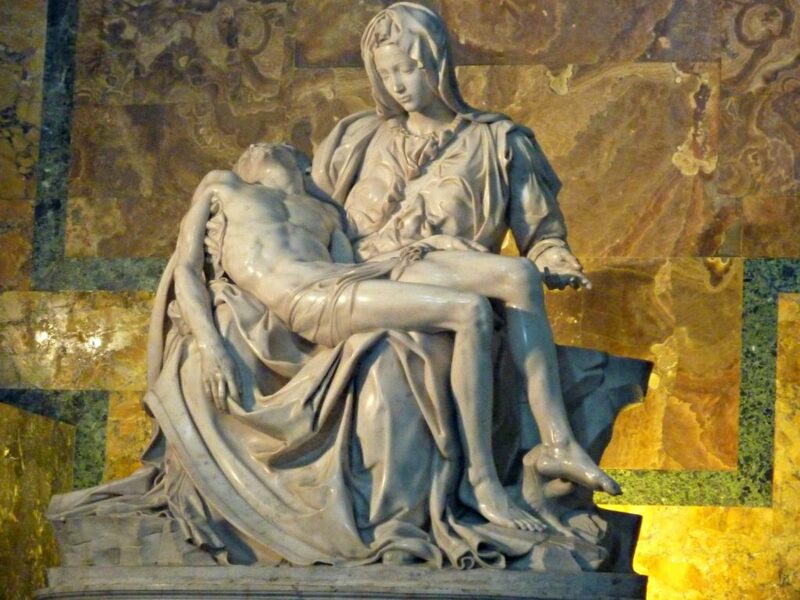 This is probably your only chance to legally get your hands on a Michelangelo masterpiece. 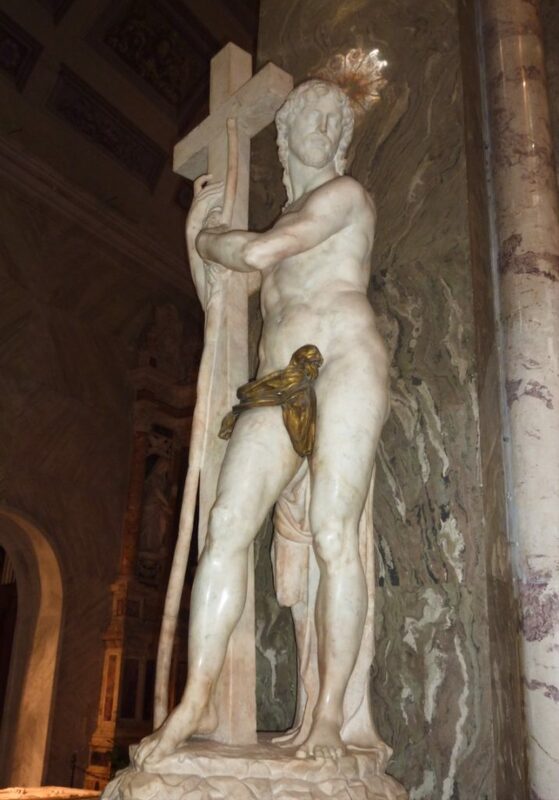 There is so much art on show inside Rome's churches you don't need to spend any money at all to see a great number of masterpieces. 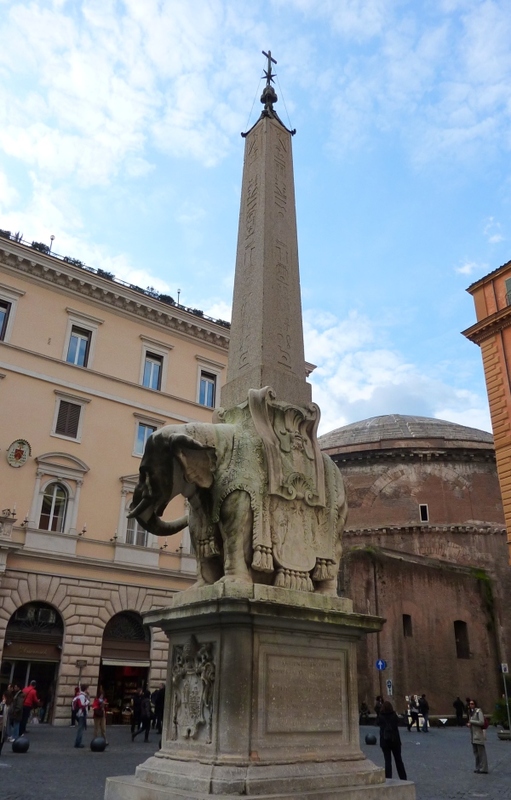 Outside the church is the Bernini Statue of the Elephant and the Obelisk. Where: Piazza della Minerva, Rome - just behind the Pantheon. When: Monday to Friday 8 am - 7 pm. Weekends hours vary according to services but you can usually enter between noon and 4 pm. We decided to walk to Trastevere from our apartment near Castel Sant Angelo - It did not look far on the map, and it was a lovely sunny Sunday morning. The walk took us across the Tiber and through the back streets; we did not use a map but instead just headed in the direction of the Porta Portese flea market. I love exploring with no set destination, strolling almost aimlessly through little streets and lanes. I think when I return to Rome we will stay in this area. The restaurants we passed, although closed at 8 am on a Sunday morning, looked much more impressive than those in the centre of town. 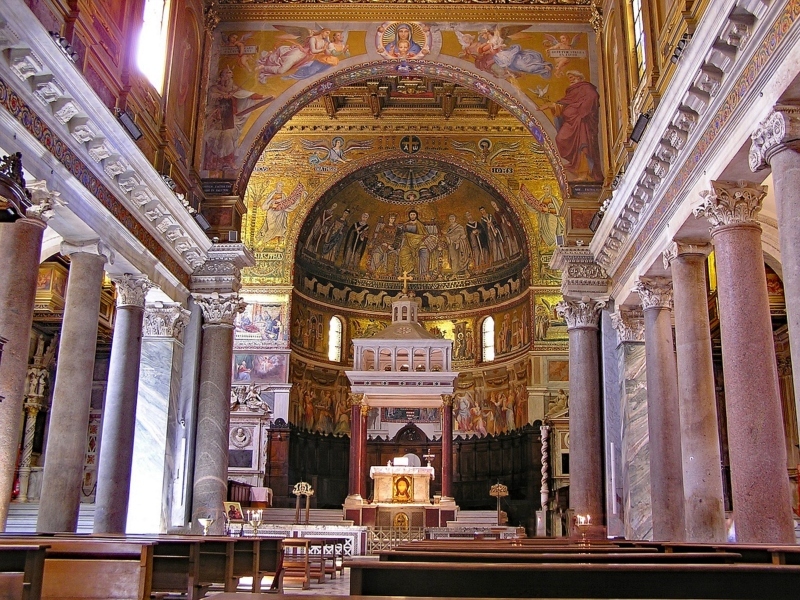 We also stumbled into the beautiful Santa Maria in Trastevere before the service began for the day. We discovered the little fountain below near a convent at the top of a hill that turned out to be a dead end. Thankfully there was a great view, so no one minded the backtracking. 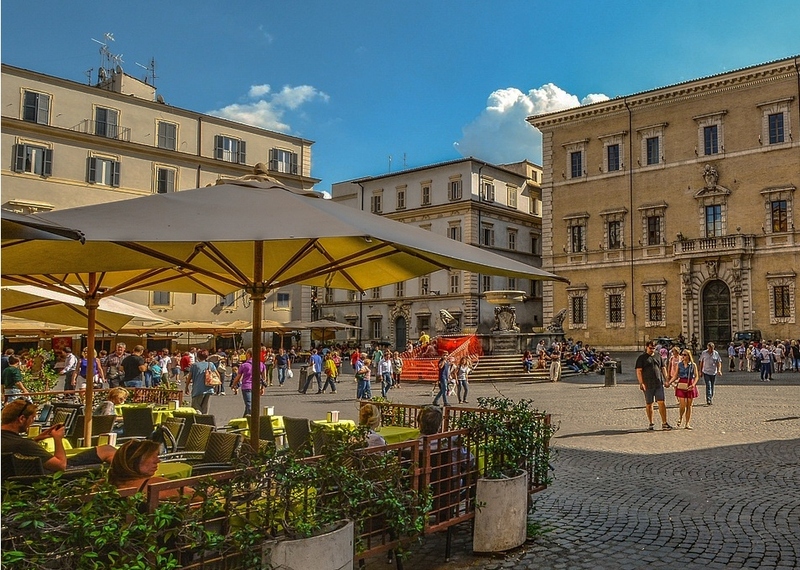 Make sure you don't miss Piazza di Santa Maria, one of the prettiest piazzas in Rome in our opinion, see the photo further down the page. We did finally make it to the market, it was OK, nothing fancy, lots of food and second hand bargains. The food was cheap, and we had some amazing pork rolls for brunch. As for shopping, I got some gloves and a jacket for my daughter for only 13 euro that she wore for the next 30 days straight, so an absolute bargain. How: Take the number 8 tram or walk from the river. Rome's Piazza's are its lifeblood. Home to beautiful fountains, markets, cafes, and some gorgeous balconies so be sure to allow yourself lots of time to explore the cities main ones listed below. Try seeing them in the early morning for a chance to photograph them without too many obstructions and in the early evening for drinks and people watching. And remember to look up! Piazza Navona - the dining room of Rome and home to 2 famous fountains, the Four Rivers and the Neptune fountain. Piazza Santa Maria in Trastevere - There is so much life here, it's a great spot for people watching. 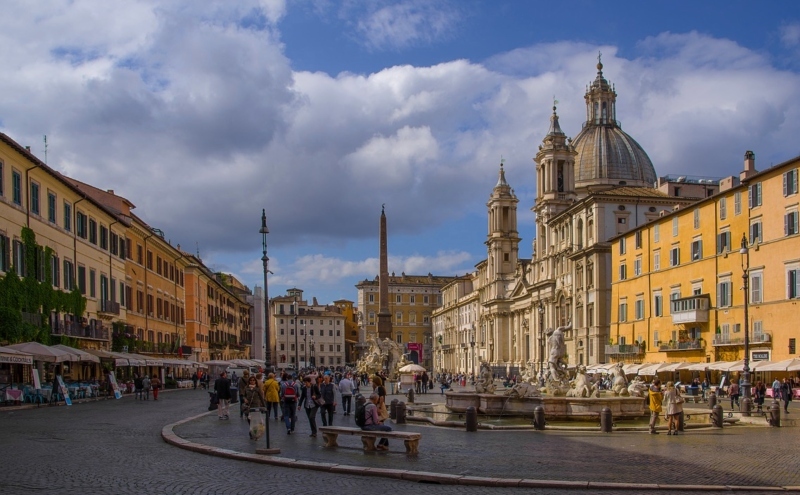 Piazza del Popolo - Huge, breathtaking space that is home to the twin churches and the lion fountain The Pincio Gardens sit high above Piazza Del Popolo and along with being a beautiful green space for picnics and strolling provide a fantastic view over the city. We made our way up here where you see the people in the top of the photo above on our final night in Rome and spent a couple of hours enjoying the gardens. I highly recommend this. Campo De Fiori - The haunting statue of philosopher Giordano Bruno was one of my favourites in all of Rome. Visit in the early morning for the market or evening for the wine bars and pizza. 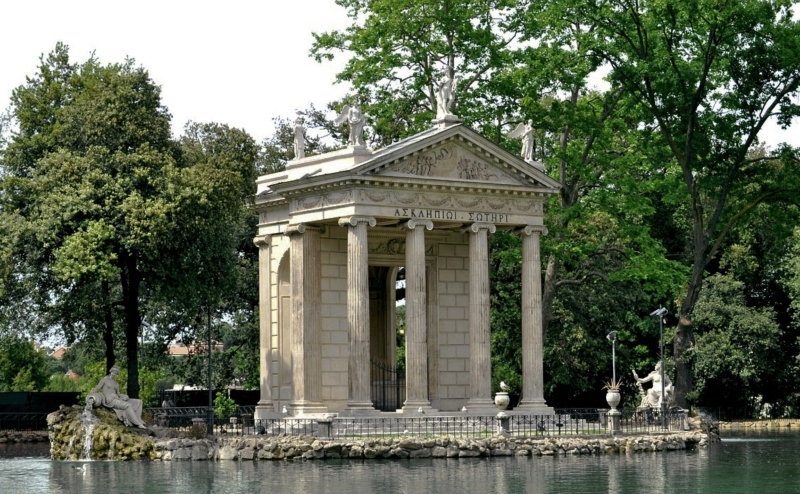 Villa Borghese is on the list for next year. Museum of Rome - The museum in Trastevere tells the story of Rome with some great models of the city in the 18th and 19th centuries. Castel St Angelo- While we explored the outside and the sculptures on the bridge next time we hope to take in the view from the top. Have you been to Rome? What was your favourite thing to do?